Potential buyers say they still plan to close on the purchase of the Gamble Mill in Bellefonte. In early August, developers Tom Songer and Mark Morath got Bellefonte buzzing as they announced an agreement to purchase and develop the long vacant waterfront property that was home to the former Bush House. 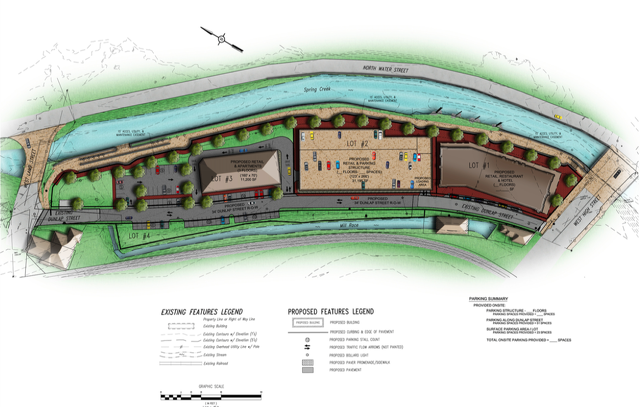 After months of anticipation, Songer recently released a vision statement for the site under the property management group Bellefonte Waterfront Associates LLC. The developers hope to start construction sometime this spring. Meanwhile, one of the brothers who in the fall announced plans to purchase and renovate the Gamble Mill building said recently that they still plan to close on the property. Bellefonte Waterfront Associates LLC’s vision for the former Bush House property is highlighted by a 75-room boutique hotel with a meeting and banquet room and a restaurant. The next step for the project is completion of the design and approval for the site. If hotel construction is to begin this spring as the group hopes, the plan is then to begin construction of a retail and condo building on the Lamb Street side of the property in the spring of 2020. At the August announcement, Songer said construction of the hotel would take nine months to a year. The five- to six- story hotel is to be constructed at High and Dunlap streets. The hotel’s architecture is to complement historic Bellefonte and would face Talleyrand Park and Spring Creek, with a promenade along Spring Creek from High Street to Lamb Street. Dunlap Street will be reconstructed adjacent to the existing Bellefonte mill race that fed water to the historic Gamble Mill. Dunlap Street is planned to be a two-way street, connecting High and Lamb streets. Plans include a large green area next to Lamb Street with some parking spaces. People will be permitted to launch kayaks and canoes from this area. The main entrance to the hotel building looks to be along Dunlap Street. There will be a parking area with a covered portico with an additional “upscale entrance from High Street.” The restaurant will face High Street and the waterfront with outdoor cafe-style seating, allowing guests to “experience the ambiance of the area along with a view of the promenade along Spring Creek.” The ballroom will accommodate 250 to 300 guests and will also include views of Talleyrand Park and the waterfront. The hotel will feature guest rooms on the upper floors that complement “the charm of Bellefonte” and will include a Juliet-style balcony that will not protrude from the building. The footprint of the hotel is to be 18,000 square feet and will not include a basement or underground parking. Guest, commercial and residential parking will be available in a lot between the two structures. The apartment building on the north side of the lot looks to be six -or seven-stories and will have offices and retail space on the first floor, and one- and two-bedroom condos on the upper floors. Each resident will have a parking space and there is no planned age limit for the condos. Songer is a registered professional engineer with more than 40 years of experience in developing residential and commercial projects in the State College and Bellefonte areas. He currently serves as the managing partner of the Torron Group. Morath has been in the hospitality and hotel business for more than 40 years. He is currently president and CEO of Hospitality Asset Management Co. and operates 11 hotels and four restaurants in the region. The waterfront property formerly contained the historic Bush House Hotel, built in 1868. It was destroyed by a fire in 2006 and the property has been mostly vacant since. Loss of the Bush House prompted the borough to evaluate options for the property and a study completed in 2011 with community input envisioned redevelopment with a boutique hotel, businesses and possibly housing. But first the land needed to be raised out of the flood plain. The Cerro Brass warehouse and an old sign factory were torn down and the historic freight warehouse moved to Talleyrand Park to raise the land and create space for development. It also led to the new walkway and wall along the creek. The development does not include the walkway and wall along Spring Creek, which were completed in 2016, and will remain owned by the borough. It also does not include the adjacent Gamble Mill property. 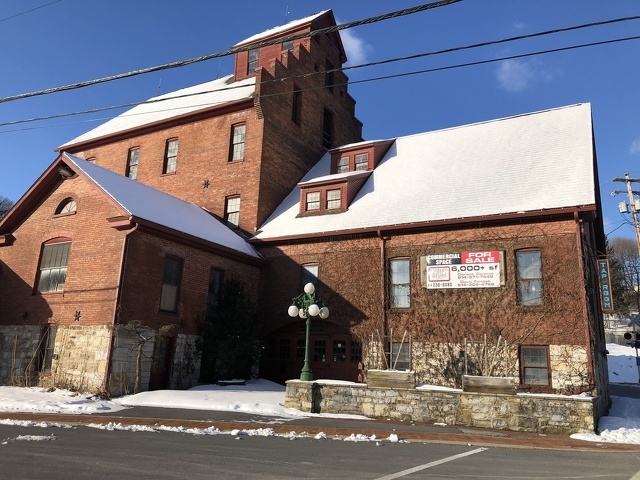 In November 2018, brothers Chris and Jonathan Virgilio announced plans to purchase and renovate the Gamble Mill building. Although there was hope that a closing date would be announced by the end of November, Bellefonte borough Manager Ralph Stewart said the sale has not gone through. He believes that the developers are still in the process of closing on the property and hopes that is the case. On Feb. 25, Jonathon Virgilio said they still plan on closing on the property, but that there were no announcements to be made. Stewart said that the borough has been contacted by other interested parties in developing the property if the current sales agreement falls through. The Gamble Mill property, at 106 Dunlap Street, has sat vacant since a restaurant there closed in 2015. Since then, there have been numerous announcements about plans to redevelop the old building, but they all have fallen through, leaving many in the community concerned about the current potential plans. The Gamble Mill in Bellefonte has been vacant since 2015. 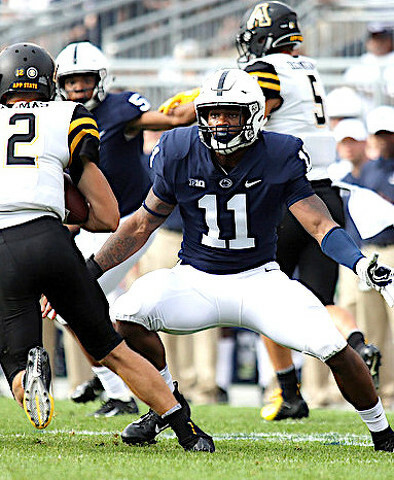 In 2019, the strength of the Penn State football team will be its defense. And the strength of the defense will be, in many ways, its coaches. Let’s not overstep, though. X’s and O’s are important, but as legendary PSU D-coordinator Tom Bradley preached to me for many years, it’s all about the Jimmys and Joes.